71 Toes: my 2016 "word"
I do a "one word" theme each year...something I want to concentrate on to help me "become" who I really want to be. And I determine what that word will be at the beginning of each calendar year (example with links back HERE). There is always so dang much to work on. Some years it's completely obvious what my word should be, like someone came and whispered (or yelled) it in my ear. Other years I list all kinds of options and I really have to dig deep to figure out what's most important. Well, this year was an easy one. I knew what I wanted to work on well before 2016 even started. Because I needed to high-tail it into gear and gain some DISCIPLINE. Isn't that a beautiful word? One that demands some respect? There are a bunch of definitions of discipline that outline willingness to follow rules and orders. And although that's great and all, that's not really what I had in mind when I picked the word (or when it picked me). Something that "corrects, molds, or perfects" is exactly what I needed. I was flying by the seat of my pants way too much. I wasn't sleeping enough. I was burning the candle at both ends. I needed to get more order in my life and I realized I needed to be the one to do the enforcing. I wanted to gain that control through "enforcing obedience or order" a little better upon myself. I wanted "orderly conducts and patterns." Bottom line is that I wanted "c" above: self-control. Sure, I have it on certain things. But I wanted to be in control of more of my life. I wanted to gain more mental self-control. Mental self-control used in correcting or changing behavior. Learning something or training for something. I wanted to control my life rather than letting it control me. I wanted to change my behavior as I trained myself to be in better control of things around me. Because I didn't have a good plan for accomplishing the main things I wanted to do each day, I was out of whack. I wanted to be a better planner. I wanted to be a better nurturer, both in love and attention but also in sustenance (what food we bring into our home) for myself and my family. And although I have always had a believing heart, I wanted to work on my relationship with my Savior. And all that takes discipline. So, the reason I haven't written about this yet is because I like to get things semi in-control before I blab it out to the world because I don't want my life to just be a whole slew of good intentions and half-baked ideas. I wanted to have a good handle on this idea before I wrote about it. 1) I can't wave a magic wand and suddenly have discipline (ha! of course I know that but still feels good to put it out in writing). 2) I will never be perfect at this, no matter how long I wait to write about it. Gaining discipline, just like everything in life, is worked on bit by bit, piece by piece, precept upon precept, and it's really the steps that help gain power...even the baby steps. 3) I need to narrow down my "discipline dreams." There are uncountable ways to have more discipline in life, and I can't do it all at once. And really, nor do I want to. If I turn my life into a regimented routine it just wouldn't be me any more. I need flexibility. I need to choose a few areas and work on those. The areas I've had in my mind from the beginning are discipline of thought, discipline of sustenance, and discipline of the spirit. In order to get more discipline of my thoughts I need systems. Systems for emails and for planning. My mom once wrote an essay called "thing order precedes thought order" and although that may not work for everyone, if my office and in-box have order my thoughts are more ordered. I've worked on these this year and have come up with a few ideas, but boy for the most part I am a complete mess in this category. I know that thought order is also preceded by sleep order, and I am on a continual quest to get more of that (health reasons as well as sanity). Thought order is my focus for September so I will have to report on how I do, but any ideas are welcome. To get discipline of sustenance we have a few things we are really working on around here to get some more discipline about what kinds of food we fuel our bodies with and bring into our home. August was a month of some menu changing and working to figure out some more healthy routines. That is still a work in progress but we have gone to much lighter dinners and trying to get to sugar only once a week which, when put in practice, works wonders on how I feel, and how my family feels too. Finally when school started and I realized I was enabling my girls too much helping them get ready in the morning. 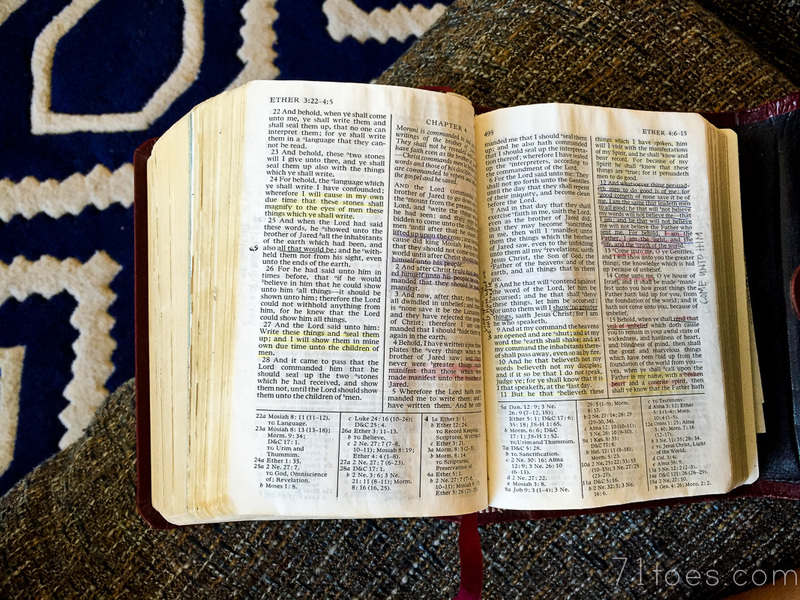 I had this little epiphany that it would be good for all of us if I sent them off to make beds and get dressed on their own for the first ten minutes while I pulled out my scriptures and did my own private study. Oh boy, it has been the most amazing transformation for me. I have been able to "feast" more on those words. It's so interesting how even a recounted war or a simple seemingly insignificant verse have made me ponder the modern world around me. 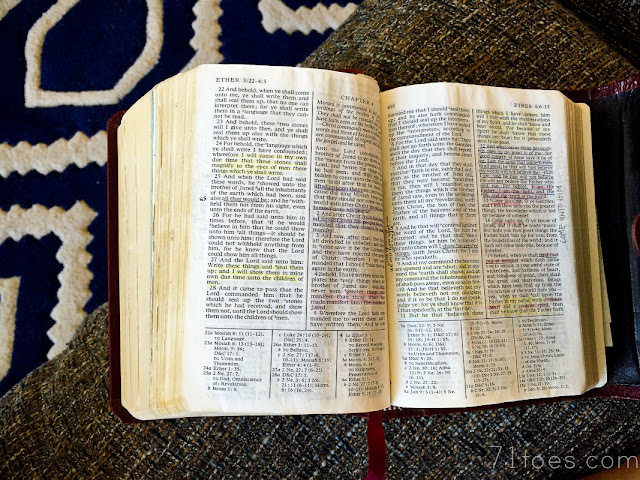 If I were really disciplined I would have a little scripture journal sitting next to my scriptures to take notes to further solidify my thoughts, but line upon line, right? Baby steps. Bottom line is that this word is a big one for me. Thanks for letting me think through writing this morning. This little therapy session with myself is gearing me up to get some better discipline in my life before the end of 2016. Boy did I need this this morning. Discipline is a word I need to focus on too. "The Root and Meanings of discipline. Discipline comes from discipulus, the Latin word for pupil, which also provided the source of the word disciple (albeit by way of a Late Latin sense-shift to “a follower of Jesus Christ in his lifetime”)." Discipline comes from disciple, and it is apparent that you are a follower of Christ. Advice on number 2: Don't multitask. Advice overall: Let go off things that just don't get done. I have a magazine that I really want to read all tthe time. But I don't manage to do it. So from time to time I just throw it out. I guess this goes along with number 3. Thank you for sharing this. I have often wondered how you juggle everything. I guess it is something that needs constant tweaking. I have enjoyed this free course: http://classes.brookesnow.com/a-thriving-life-course/ I got a lot of inspiration listening to it. Thank you for sharing so much of your life with us. I really look to your example on so many things. I'm glad your therapeutic writing translated into therapeutic reading for me...now on to my therapeutic DOING! It's the perfect word. We also do really well with regular family scripture study, but my own study was also lacking. What I found that really helps is to sit down and put several general conference talks on my youtube playlist. This way I can choose topics that I am currently focused on. I also pop my headphones in and just listen to the scriptures while I clean or run errands. Perfect shot in the arm! Just what I needed!